The history of Penfield and its school system is in need of research. 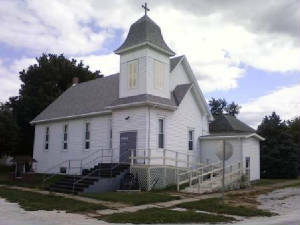 Penfield is well known as an antique tractor supporter and its former grade/high school (pictured above) is now used as an agricultural museum. Penfield High School probably was established in the late 1800's. Though it is not verified, we feel Penfield High School may have closed her doors as a high school in the late 1940's. 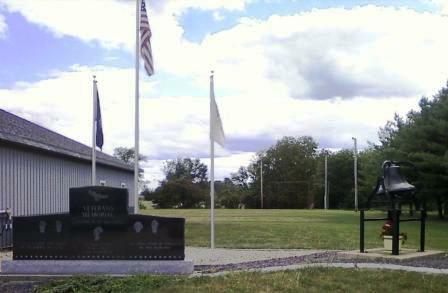 The high school aged kids of Penfield were then bused to nearby Armstrong to attend high school. Armstrong High School is still in operation today. 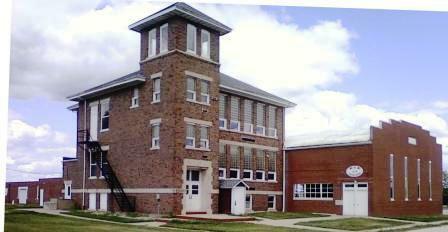 Penfield may have maintained its grade school status for some years after the high school closed. However, this information is not known. Penfield should be commended for their excellent use of their former school building. As you can see above, Penfield residents took advantage of this great resource and put it to a worthwhile and proud usage. Other great photos of Penfield, Illinois can be enjoyed at http://www.infinityfarms.com/penfield_illinois.htm and http://www.antiquefarm.org/mainsite/museum/museum_index.html . Excellent job!! Penfield High School definitely offered basketball as is evidenced by their two District Titles won. PHS probably also offered baseball and track like all other small schools of its day. We are hopeful a Penfield resident can help us out with this information. The Penfield boys won two District titles during their existence. It is quite possible other great seasons were enjoyed. If you have this information, please share it with us. The two title years are listed below. In 1928-29, the school won the district title with just 15 boys in the school (10 girls) and it did not have the luxury of having its own gym. The Penfield High School boys won the first two games of the Sectional Tournament placing them in the SWEET 16 of the IHSA Tournament in the one-class basketball tournament. Included in their wins in the Sectional were victories over Marshall and Kankakee, schools many times larger then Penfield. The PHS boys would lose in the title game to Champaign High School, who would go on to place 2nd in the IHSA Tournament that year. The following season, Penfield started the season with over 30 consecutive victories before bowing out of the state tournament at the District level. Unfortunately, records of the teams are not known. We have located some scores from the IHSA State Tourney that Penfield High School participated in on a website titled "Illinois Postseason Basketball Scores". The scores that we located on this website are reprinted below. Beginning of the basketball program through 1927-28 Postseason scores, coaches' names, and records needed. Danville Sectional Tourney 2nd Place! Champaign Placed Second in State! 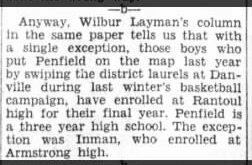 **After the 1929-30 season ended the Penfield High School boys had 4 starting players that wished to play one more year of high school basketball. Inman would go on to play at Armstrong High School. Zimmerman, Willard, and Starns would continue their last season at Rantoul High School. The boys continued to have an impact during their senior years. Inman led the Armstrong High School team to a District Championship and a spot in the Sectional title game against...…..you guessed it, the Rantoul High School basketball team. Rantoul would be Armstrong 23 - 19 in that game. Rantoul would lose in the Elite 8 game to Johnson City who would place 4th in the finals of the IHSA Tourney that year. 1930-31 Postseason scores, coach's name, and record needed. 1932-33 Postseason scores, coach's name, and record needed. 1933-34 Postseason scores, coach's name, and record needed. 1934-35 Fisher District Tournament Coach's name & record needed. Fisher lost in semi-final round. No other scores were located on the Illinois Postseason Basketball Scores website for Penfield.